As previously discussed, the Storage Access Framework considerably eases the process of integrating cloud based storage access into Android applications. Consisting of a picker user interface and a set of new intents, access to files stored on document providers such as Google Drive and Box can now be built into Android applications with relative ease. With the basics of the Android Storage Access Framework covered in the preceding chapter, this chapter will work through the creation of an example application which uses the Storage Access Framework to store and manage files. The Android application created in this chapter will take the form of a rudimentary text editor designed to create and store text files remotely onto a cloud based storage service. In practice, the example will work with any cloud based document storage provider that is compatible with the Storage Access Framework, though for the purpose of this example the use of Google Drive is assumed. In functional terms, the application will present the user with a multi-line text view into which text may be entered and edited, together with a set of buttons allowing storage based text files to be created, opened and saved. Create a new project in Android Studio, entering StorageDemo into the Application name field and ebookfrenzy.com as the Company Domain setting before clicking on the Next button. On the form factors screen, enable the Phone and Tablet option and set the minimum SDK setting to API 26: Android 8.0 (Oreo). Continue to proceed through the screens, requesting the creation of an Empty Activity named StorageDemoActivity with a corresponding layout named activity_storage_demo. The user interface will need to be comprised of three Button views and a single EditText view. Within the Project tool window, navigate to the activity_storage_demo.xml layout file located in app -> res -> layout and double-click on it to load it into the Layout Editor tool. With the tool in Design mode, select and delete the Hello World! TextView object. Drag and position a Button widget in the top left-hand corner of the layout so that both the left and top dotted margin guidelines appear before dropping the widget in place. Position a second Button such that the center and top margin guidelines appear. The third Button widget should then be placed so that the top and right-hand margin guidelines appear. Change the text attributes on the three buttons to “New”, “Open” and “Save” respectively. Next, position a Plain Text widget so that it is centered horizontally and positioned beneath the center Button so that the user interface layout matches that shown in Figure 70-1. Use the Infer Constraints button in the Layout Editor toolbar to add any missing constraints. Using the Attributes tool window, configure the onClick property on the Button widgets to call methods named newFile, openFile and saveFile respectively. Working with files in the Storage Access Framework involves triggering a variety of intents depending on the specific action to be performed. Invariably this will result in the framework displaying the storage picker user interface so that the user can specify the storage location (such as a directory on Google Drive and the name of a file). When the work of the intent is complete, the application will be notified by a call to a method named onActivityResult(). Since all intents from a single activity will result in a call to the same onActivityResult() method, a mechanism is required to identify which intent triggered the call. This can be achieved by passing a request code through to the intent when it is launched. This code is then passed on to the onActivityResult() method﻿ by the intents, enabling the method to identify which action has been requested by the user. Before implementing the onClick handlers to create, save and open files, the first step is to declare some request codes for these three actions. ﻿When the New button is selected, the application will need to trigger an ACTION_CREATE_DOCUMENT﻿ intent configured to create a file with a plain-text MIME type. When the user interface was designed, the New button was configured to call a method named newFile(). It is within this method that the appropriate intent needs to be launched. This code creates a new ACTION_CREATE_INTENT﻿ Intent object. This intent is then configured so that only files that can be opened with a file descriptor are returned (via the Intent.CATEGORY_OPENABLE﻿ category setting). Next the code specifies that the file to be opened is to have a plain text MIME type and a placeholder filename is provided (which can be changed by the user in the picker interface). Finally, the intent is started, passing through the previously declared CREATE_REQUEST_CODE. When this method is executed and the intent has completed the assigned task, a call will be made to the application’s onActivityResult() method and passed, amongst other arguments, the Uri of the newly created document and the request code that was used when the intent was started. Now is an ideal opportunity to begin to implement this method. The code in this method is largely straightforward. The result of the activity is checked and, if successful, the request code is compared to the CREATE_REQUEST_CODE value to verify that the user is creating a new file. That being the case, the edit text view is cleared of any previous text to signify the creation of a new file. Compile and run the application and select the New button. The Storage Access Framework should subsequently display the “Save to” storage picker user interface as illustrated in Figure 70-2. From this menu, select the Drive option followed by My Drive and navigate to a suitable location on your Google Drive storage into which to save the file. In the text field at the bottom of the picker interface, change the name from “newfile.txt” to a suitable name (but keeping the .txt extension) before selecting the Save option. Once the new file has been created, the app should return to the main activity and a notification will appear within the notifications panel which reads “1 file uploaded”. 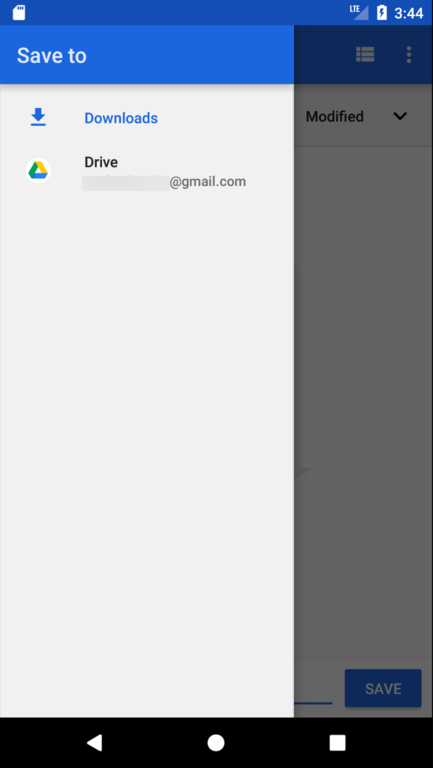 At this point, it should be possible to log into your Google Drive account in a browser window and find the newly created file in the requested location. In the event that the file is missing, make sure that the Android device on which the application is running has an active internet connection. Access to Google Drive on the device may also be verified by running the Google Drive app, which is installed by default on many Android devices, and available for download from the Google Play store. The method begins by obtaining and opening the file descriptor from the Uri of the file selected by the user. Since the code will need to write to the file, the descriptor is opened in write mode (“w”). The file descriptor is then used as the basis for creating an output stream that will enable the application to write to the file. The text entered by the user is extracted from the edit text object and written to the output stream before both the file descriptor and stream are closed. Code is also added to handle any IO exceptions encountered during the file writing process. With the new method added, compile and run the application, enter some text into the text view and select the Save button. From the picker interface, locate the previously created file from the Google Drive storage to save the text to that file. Return to your Google Drive account in a browser window and select the text file to display the contents. The file should now contain the text entered within the StorageDemo application on the Android device. This method begins by extracting the file descriptor for the selected text file and opening it for reading. The input stream associated with the Uri is then opened and used as the input source for a BufferedReader﻿ instance. Each line within the file is then read and stored in a StringBuilder object﻿. Once all the lines have been read, the input stream and file descriptor are both closed, and the file content is returned as a String object. With the coding phase complete the application is now ready to be fully tested. Begin by launching the application on an Android device or AVD configured with your Google account identity and selecting the “New” button. Within the resulting storage picker interface, select a Google Drive location and name the text file storagedemo.txt before selecting the Save option located to the right of the file name field. When control returns to your application look for the file uploading notification, then enter some text into the text area before selecting the “Save” button. Select the previously created storagedemo.txt file from the picker to save the content to the file. On returning to the application, delete the text and select the “Open” button, once again choosing the storagedemo.txt file. When control is returned to the application, the text view should have been populated with the content of the text file. It is important to note that the Storage Access Framework will cache storage files locally in the event that the Android device lacks an active internet connection. Once connectivity is re-established, however, any cached data will be synchronized with the remote storage service. As a final test of the application, therefore, log into your Google Drive account in a browser window, navigate to the storagedemo.txt file and click on it to view the content which should, all being well, contain the text saved by the application. 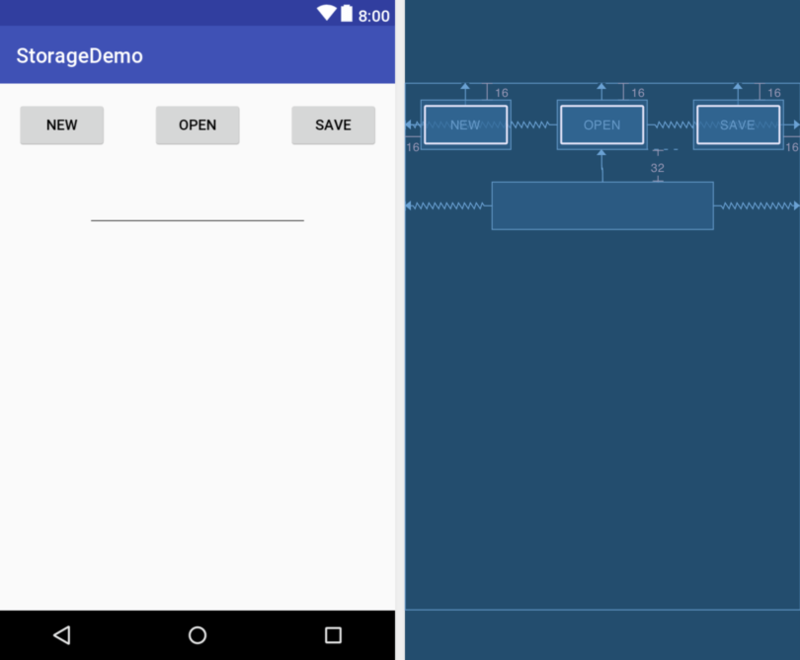 This chapter has worked through the creation of an example Android Studio application in the form of a very rudimentary text editor designed to use cloud based storage to create, save and open files using the Android Storage Access Framework. This page was last modified on 15 January 2019, at 20:02.